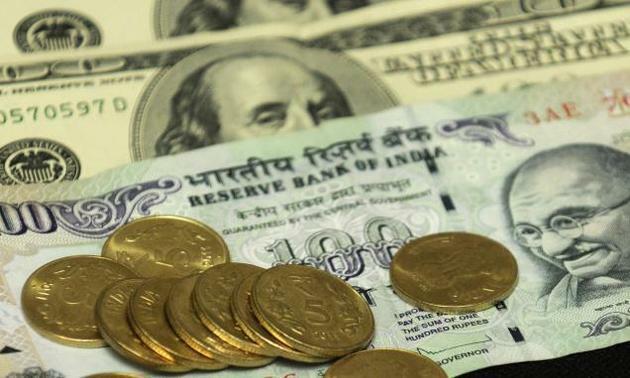 MUMBAI: The rupee weakened by 17 paise to trade at 71.33 against the US dollar in opening session on Friday following sustained demand for the greenback from importers amid foreign fund outflow and rising global crude prices. The dollar's gain against major world currencies also impacted the rupee sentiment, forex dealers said. At the forex market, the rupee opened weak at 71.22 and slipped further to quote 17 paise down at 71.33 against the US dollar. Brent crude futures, the global benchmark, climbed to USD 65.04 per barrel by rising 0.63 per cent. Strengthening US dollar and persistent outflow from the domestic capital market weighed on the domestic currency. Foreign portfolio investors (FPIs) sold shares worth a net Rs 250.23 crore Thursday, provisional data showed. On Thursday, the rupee had depreciated by 36 paise to close at 71.16 per US dollar. Meanwhile, the benchmark BSE Sensex fell 34.73 points, or 0.13 per cent, to 35,841.49 in early trade.